Note: From AirOS version 5.6.9 and forward, the following is no longer necessary, because you can reserve IP addresses directly from the Nanostation’s web interface. 2017-01-11. The Nanostation M5 from Ubiquity has a comprehensive and beautiful web GUI interface that enables customization of a large number of settings. Unfortunately, reservation of IP addresses for specific hosts on the local network in the Nanostation’s DHCP server is not possible via the GUI. This is a bit strange, because the GUI does allow port-forwarding, an option which is a bit useless without the possibility to reserve an IP address on the LAN to forward traffic to. The Nanostation runs a tiny Linux system (“AirOS”), and many of the standard UNIX tools are available via busybox. Fortunately, AirOS allows users to add scripts in the /etc/persistent directory of the Ubiquiti device. These statements will ensure that the device with the given Mac address is given the same IP address every time it joins the network. In order to prevent that other devices are given these adresses, they should be chosen outside the range of IP addresses normally handed out by the DHCP daemon. This range is defined in the Nanostation’s web GUI. 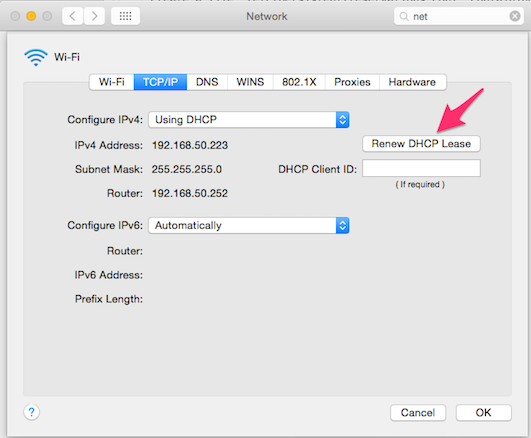 When the Nanostation is back up, reboot your device or simply renew the DHCP lease. Below is shown how this is done in Mac OSX 10.10.